Summary: Elliot and Kalish are friends who live in different parts of the world. Elliot lives in America,and Kalish lives in Indian. They compare their communities they live in,their families, and their daily lives to one another. They find out that their lives are slightly different but they are alike as well. For example they both write the alphabet, but Elliot uses the American alphabet, and Kalish uses the Indian alphabet. Another example is they both ride a bus to school but they look a little different. Representation:This book represents Element 2 respect for others, because it demonstrates the acceptance of diversity. Elliot and Kalish are comparing their lives in a respectful way seeing their similarities, as well as their differences. 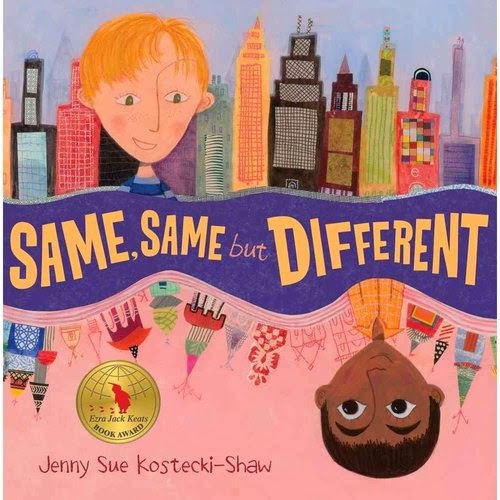 Usage: I would use this book to introduce diversity, and the acceptance of different ethnics. I would begin the lesson about diversity with this book, because even though Elliot and Kalish are a little different they accept one another for who they are, and also relate each other lives to their own . This book sends the message that is okay to be different, but even though we are different their are some similarities in our traditions, and lives.